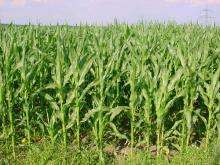 The lab's current research has now shown that by producing a weaker-than-normal version of the FEA2 gene – one whose protein is mutated but still partly functional—it is possible, as Jackson postulated, to increase meristem size, and in so doing, get a maize plant to produce ears with more rows and more kernels. More information: "Quantitative variation in maize kernel row number is controlled by the FASCIATED EAR2 locus" appears online in Nature Genetics on February 3, 2013. Would it not be more efficient to increase the number of ears per stalk to 5 (next Fibonocci number) instead of 3? More ears means more stalk. Each plant can only grow so much total biomass. increasing the size of each ear is much more efficient than adding new ears. Edit: Delete -- never mind, decided against feeding the troll. Malthus the saint curses you all, all eight billion of you, humans. I like this article because they correctly identify the plant as Maize. Maybe one day we will simply grow kernels in a solution or on a substrate like a sponge in a couple of weeks in stead of waiting months for a whole plant to grow. We can grow animal eggs and sperm from stem cells in a lab, so why not do the same with plant seeds? Now THAT would be a huge deal. No more cultivation, fertilization, irrigation, pesticides, harvesting or transportation (you would grow it where you're gonna process it). Same goes for other food products. Perhaps one day we will just grow muscle tissue in stead of raising whole cows, pigs and fish. The funniest thing is that a big part of the population they claim to feed doesn't actually eat corn (though they do eat meat, I agree). I admit I didn't even read the whole article. I just can't buy that all "glorious progress on feeding the hungry" tone. The facts are that there is GM corn for quite long time now. And there is NO progress on feeding the hungry what's-o-ever. The moneyless are simply not the target group for such production. On the other side, rare diseases and cancer are getting more and more often. It is not hard to see why some people just hate GMO products. I mean what do I care, that a farmer would produce more corn with less investments, when I buy the food on the same price and what I or anyone don't BUY, just gets thrown out or burnt, instead of fed to the poor. If I am to buy something, it would be organic, thank you very much!